A wide range of benign tumours, cysts and blocked glands can form on the eyelids. Benign tumours are abnormal growths, but in general they do not invade or damage the surrounding tissue and therefore are not dangerous in the same way as malignant tumours which invade the surrounding tissue and sometimes can spread around the body. 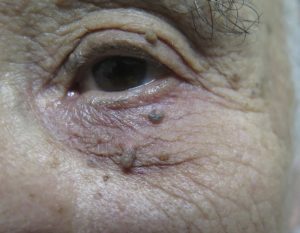 Cysts and blocked glands are fluid filled lumps under the eyelid skin that generally form from the glands that produce sweat or part of the tears. Although these benign eyelid lesions do not generally cause damage to the surrounding tissue and certainly do not spread around the body, they can cause symptoms or the diagnosis be uncertain therefore surgical removal may be appropriate. What symptoms can benign eyelid lesions cause? Pressure: blocked glands can cause a feeling of pressure because of the build-up of fluid in the cyst. Cosmetic: benign eyelid lesions can be unsightly, particularly as the eyes and eyelids are highly visible parts of our body. Uncertainty and anxiety: sometimes it can be impossible to know if a lesion is benign or malignant. Therefore, removal may be preferred so that the lesion can be examined in the laboratory (histopathological examination) to determine exactly what it is. If it is a benign lesion this is very reassuring and if it is a malignant lesion a more extensive excision can be planned. Do benign lesions need to be removed? If a benign lesion is not causing any symptoms there is no need to remove it, unless there is uncertainty about the diagnosis (see above). How are benign eyelid lesions removed? Benign lesions are almost always removed surgically. This is usually a very minor daycase procedure. After a clinic assessment of the lesion, local anaesthetic eyedrops are instilled into the eye and local anaesthetic is injected into the skin around the lesion. These injections sting, rather like dental injections. The lesion is excised and sometimes a few small stitches are required to close the incision. You may have an eyepatch and some antibiotic cream to take home depending on the lesion and the surgery. Most lesions are sent for examination in the laboratory (histopathology) to be certain that they are benign. Eyepad: if you do have an eyepad, I will advise you when you can remove it. 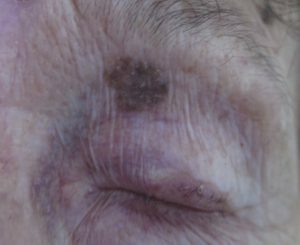 Swelling and bruising: although removal of eyelid lesions is minor surgery, it can still cause swelling and bruising and even a ‘black eye’. This may be reduced by applying a small ice pack to the area for 20 minutes at a time, followed by a 20-minute period without the ice pack, three to four times a day for a few days after the surgery. Pain: this can usually be managed with paracetamol (Panadol®) or ibuprofen (Neurofen®). Eye cream: We may give you some antibiotic cream to use after the operation although not all operations require this. Stitches (sutures): if you do have stitches, we will make you a follow up appointment at which the skin sutures are likely to be removed. Sutures under the skin are left to dissolve. Scarring: I will aim to place all cuts in locations that are hidden by your natural skin creases and folds and to suture them in such a way as to minimise scarring, but you may be left with a tiny scar line. Infection of the wound (less than 1:100). This might require antibiotic treatment. Bleeding: Significant bleeding is very rare (<1:1000) but it is very common to have minor bleeding for a few hours or even a day or two afterwards particularly if you are on blood thinners. Recurrence of the lesion: most lesions do not recur after they have been removed, but on occasion benign lesions can come back, particularly if they have been incompletely removed. Temporary blurred vision: the swelling, excess tear production and antibiotic cream can all blur the vision a little. Should I contact my medical team after the operation? It is very rare to have any significant problems or complications after surgery to remove minor lesions but there are some things to look out for. If any of the following occur, you should contact the clinic or me. Reduced vision that is not just from the eye cream, i.e. if you blink a few times, the vision is still reduced. Persistent bleeding that does not settle with an eyepad/pressure for a few hours. The follow up will depend on the nature of the lesion and the surgery. If there are stitches we will make you an appointment to remove these 7-14 days after surgery. If the lesion has been sent for laboratory examination we will contact you to advise of the result as soon as we know.